Which Safe Haven Market Will Dominate in 2019? 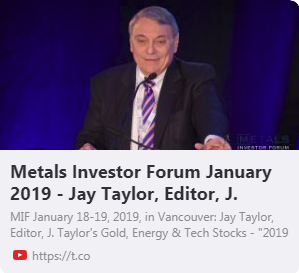 In my January 2019 Metals Investor Forum Speech, I explain why I think money may flow into gold as well as U.S. Treasuries as U.S. equities enter a prolonged bear market in 2019. The topic assumes 2019 will be a rough year for equities and fixed income assets. If investors are confident 2019 will be a year of profitable tranquility, then no need to listen to the talk. But if you buy the idea that the end of 2018 was the beginning of a major bear market and that 2019 will see a continuation of the bear market and very possibly the start of a recession, then the question is where will proceeds of stocks’ sales go. When confidence in the global monetary system holds together then normal flow is from stocks to U.S. Treasuries and other financial asset safe havens. Such has been the flow from around November to the present. But if you believe that the financial system is on the verge of lost confidence, then a portion of the flows may go to hard assets in 2019, most notably portable hard assets like gold. There have been a number of times since the current monetary regime was instituted in August 1971, when money flowed out of stocks and U.S. Treasuries into gold. And in some of those years, especially in the early 1970s, gold rose dramatically. The only exception was in 1981 when the Fed squashed inflation by raising U.S. Treasury rates to double digits. But the ability to raise rates now is extremely limited given current massive government and public sector debt load. The recent stock market reaction in the second half of 2018 to very modest interest rate increases makes that point obvious. Clearly, surging debt in the U.S. guarantees declining living standards and rising levels of discontent domestically and globally. Out of self protection, since the 2008 financial crisis, adversarial nations like China, Russia, and Iran among others have been building up their gold reserves and directly challenging dollar hegemony by increasing global trading using currencies other than dollars. On various fronts, storm clouds are rising. After one of the longest U.S. equity bull market in history and a generation’s long U.S. Treasury bull market, odds are growing for a break from financial assets into anti-establishment safe havens most notable of which is gold. 2019 should be a good year for gold and by extension, gold shares.